Well, the Little Man had a minor accident and we had our first experience with urgent care in the Netherlands. Yesterday, we decided to take a leisurely walk to the train station, take the Sprinter train to Breda, and putter around the city center for the afternoon. Little Man wanted to take his loopfiets (balance bike), and it seemed like a good alternative to pushing around a stroller or carrying him. So off we set. We were about 2/3 of the way to the train station when Little Man fell off the loopfiets - a combination of swerving handlebars and his foot hitting the back wheel knocked him off balance and then off the bike. And he fell face-first, cutting his chin. 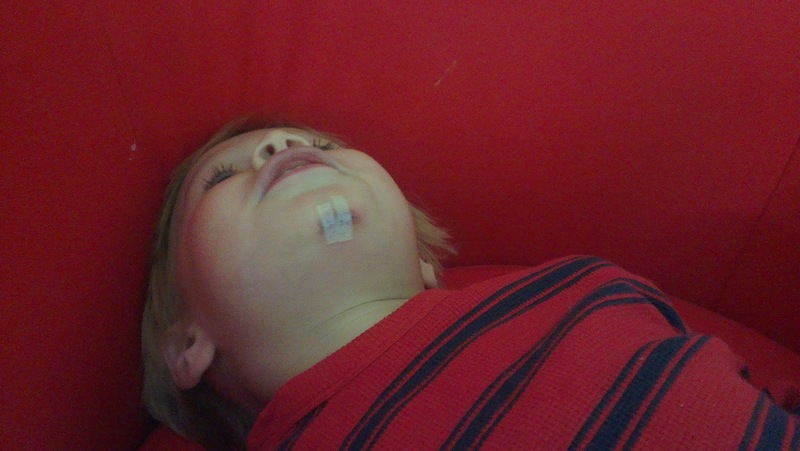 Normally a fall off of the loopfiets isn't a big deal, but because of the way he landed and since he caught the very edge of his chin, the cut was deep. So we picked him and the bike off the ground, and headed back to the house to take him home and plan our next move. At home, Mark cleaned up the cut and we decided it really did look like it needed stitches, but being a Sunday (and the Pinksteren (Pentecost) holiday on top of that) calling the huisarts (primary care doctor) wasn't an option as the office was closed. Thankfully, rather than taking a trip to an emergency room at a hospital, we made an appointment at the huisartsenpost. The huisartsenpost is similar to an urgent care clinic in America, but it's more like a group of several doctors from different practices will be scheduled to be on-call after regular office hours or on weekends or holidays to take patients with an illness that can't wait or minor injuries. The office does get busy, but it's nothing like some of the crazy-busy, soul-crushing waits that you get in a emergency room or clinic in the States. You always call before showing up to help with the flow of patients and avoid causing a longer wait for everyone involved - and it goes without saying that if you can't wait for medical attention, you should go directly to the hospital or call 1-1-2 (the Dutch equivalent to 9-1-1). So we called, gave our information, and waited for the call-back. Little Man had calmed down and was relaxing with his lovies while watching Scooby-Doo when we got the call-back about an hour and the nurse agreed that Little Man should see the doctor and made an appointment for a half hour later. We rode our bikes over to the huisartsenpost (much faster than finding the bus schedules), and checked in. Since our huisarts is part of the same group of practitioners, all of Little Man's information was already in their system - they just needed name and date of birth and we were good to go. Little Man was a trooper - his good listening and calm through the whole process made everything go quickly. His cut was cleaned up and given some "human glue" and steri-strips, he got to choose a prize from the prize-box, and he was good to go. It seems like he thinks this was the best doctor's visit ever, the doctor made him laugh, told him she liked his Chuck Taylors, and gave him bubbles - so I can see where he's coming from. Other than the funny mark on his chin you'd never know that he'd done anything spectacular yesterday and in just a few more days the mark should be less noticeable. Since we had to figure out urgent care on the fly, we're glad it was for something relatively minor and that we had cheat-sheet of phone numbers from the relocation company that helped us settle in Tilburg. And we're thankful that the Little Man is back to his old self - today he's been working on perfecting his Bugle-claws and reenacting the doctor's visit with his toys - so you know, just a normal day. 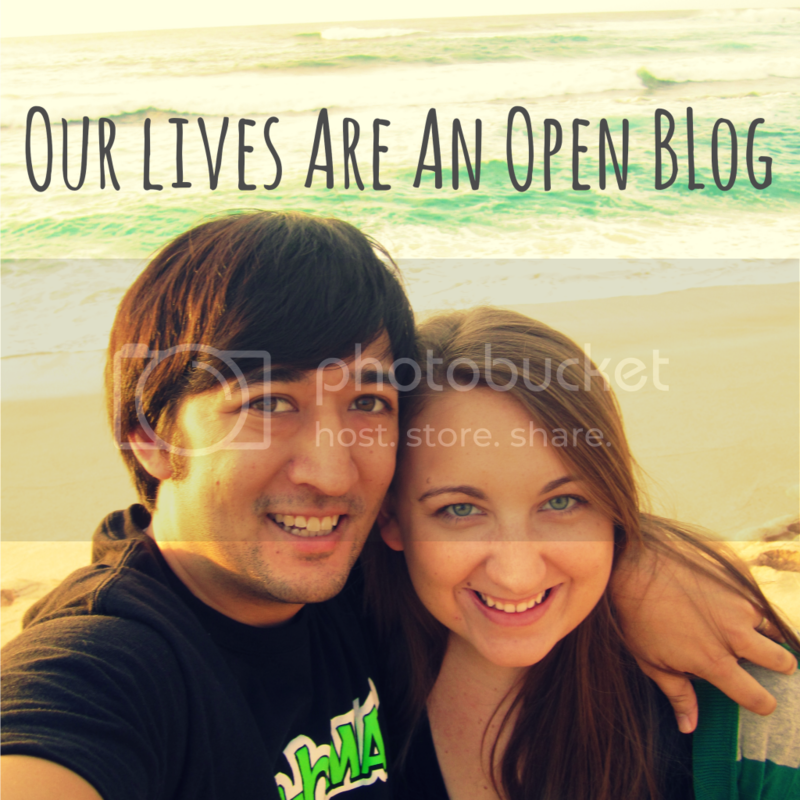 EDIT: I wish I could say the story ended here... unfortunately, we had a minor sequel. Glad he's on the mend. 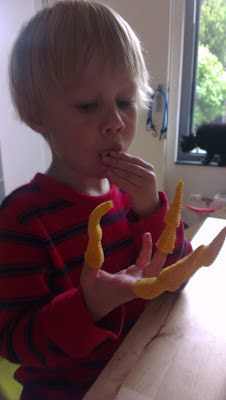 Loving the bugle claws!